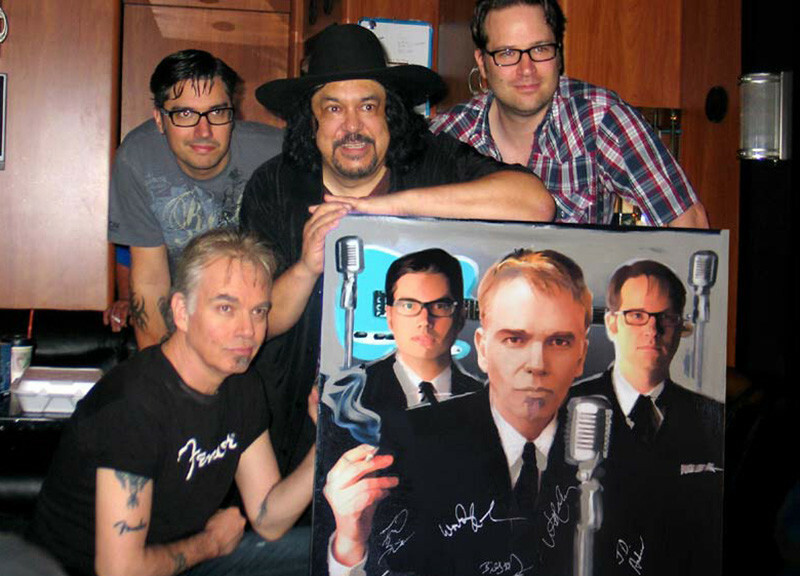 When The Boxmasters took the stage on May 2, 2009, at Willie’s Place, everyone was looking for Billy Bob Thornton. I suppose most people never would have believed that Billy Bob Thornton, who has had a very successful acting career and whose marriage to Angelina Jolie still continues to be chronicled, would leave the Hollywood world to travel with musicians on a bus. But, like his character in many movies, Billy Bob Thornton continues to mesmerize his audiences. His most notable band mates, J.D. Andrew and Michael Wayne Butler offer an indelible background with their guitars and vocals, and other band members, all dressed in black, also offer an act that spells professionalism. Seeing Billy Bob behind the microphone though, is an entire different story, and as I watched from the sidelines, behind the stage, I found myself being somewhat slightly start struck. And that does not happen very often, as I’ve been exposed to countless celebrities during my past 30 plus years as a photo journalist and artist. After their performance, it had been arranged for me to meet the Boxmasters in their tour bus. Not knowing what to expect I was very pleased to find that Billy Bob and the guys were indeed very courteous, attentive and funny as heck. The kind of fellows you’d like to dunk some beers with at any given bar. They were very pleased with my painting of The Boxmasters and we all joked around about their likenesses and their unusual signing session. Meeting these guys in their bus was a unique sparky experience, and it made me acquire a deeper respect for Billy Bob, a man who obviously has the courage to take the leap at something new, throw his heart out into space and not bother to look back. As most creatives know, one of the hardest things we do is re-invent ourselves, as often as we can. I guess some people get comfortable with one discipline. But I remember my grandfather telling me at a very young age, to chose between art or music. He really believed, as some people do, that you can’t be really really good at two professions. I went against his advice, and to this date I have no regrets for taking on so many creative outlets, music, art, photography, sculpture, just anything creative and productive. Did I accomplish greatness?… probably not…….. yet… but I have enjoyed my journey thoroughly in this crazy life of mine. Much success is ahead of Billy Bob Thornton and the Boxmasters! Billy Bob will keep re-inventing himself and in the process he will delight audiences world-wide. Not bad for a “bad boy” gone good! The Boxmasters will return to Willie’s Place at Carl’s Corner in Hillsborough sometime in May of 2010. I encourage anyone to look out for that concert and buy tickets, as their last two concerts with Willie Nelson have been sold out Stop by at Willie’s Place gallery to see the original painting, signed by all of the Boxmasters, plus Willie, Lucas Nelson, Woody Harrelson, Carl Cornelius, among others. A real treasure. Price: $4,000.